This time we are pleased to announce an interview we did with @DeltheTrader. He is an active stock trader from Toronto with 7 years of discretionary day trading experience. With a strong focus on technical analysis, Del trades momentum stocks in the small to micro cap market using strategies based on market auction theory, volume and order flow analysis. 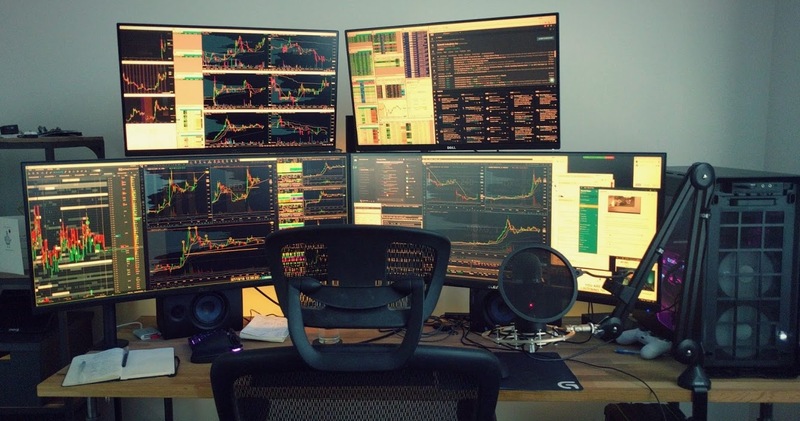 He runs a trading community and chat room at ActiveTraders.chat where he shares his screen daily for members, and has built a comprehensive video course for those who want to learn to day trade stocks using his methods. An excerpt from the recording is below too. Enjoy. Del the Trader does two things exceptionally: he’s trading stocks and publishes a series of educational videos about trading on YouTube that explicitly explain how to trade and what mistakes to avoid. He also has the ActiveTraders.chatcommunity. Tell our audience about your background, especially in design. Yeah, sure. I’m located in Toronto. This is my seventh year in trading. While it sounds amazing, I actually spent a few first years just fumbling around trying to find my rhythm, always uncovering something that was interesting for me. I wanted to make a lot of money. But I found that I had a problem with motivation. I had a job at that time. I had other priorities and it was very different to stick to something and choose a profession I would follow for the rest of my life. There is something that I love about trading, something inexplicable. Something I could not pinpoint for a long time so my personal reason to start a YouTube channel was to motivate myself to share and commit myself to learning and growing as a trader. By sharing that with others, I was able to get feedback from people and stay committed to sharing and growing my craft. Nice. And you will tell us more about Active Traders a bit later. For now, I have this question that we usually ask by the end of the interview: what does a word “trader” mean to you? Sure. It’s a great question. That changed for me from what I thought as I progressed. In my mind, a trader is someone who can manage risk well and can protect capital. The reason why I say that, is that anybody who goes and buys a stock or sells it, is not a trader, he’s a speculator. When you say about being a day trader, a swing trader, or an investor, the one key factor that travels across all of those fields is that you are a risk-manager and you grow accounts by respecting the capital and protecting it. So for me being a day trader means to be a risk manager, stick to my plan, and be an operator of my own business plan and trading strategy. And obviously, grow an account. Could you compare yourself to an entrepreneur? Oh, 100%. You have to have that entrepreneurial spirit, being a one-man-army, or one-woman-army. It is not that easy. You need to create this scaffolding around your learning to help prop yourself up. I strongly recommend writing down what your goals are and try to meet them every single day. They can be small goals, they can be long-term goals. But what you are doing is really growing your personal business. At the beginning, you mentioned that you wanted to make a lot of money. Looking back at your experience, 7+ years of trading, do you think you have achieved this goal? Did your goals change over time? Goals definitely change. One goal that doesn’t change is making more money. Which is fine, because what you do is add goals on top of each other and that becomes some sort of objective. At the beginning, I was really interested in making a lot of money which made a lot of sense to me at that time. But as I went on, I realized that making more money means more risk. If you don’t have this risk in check, you can downfall fairly quickly. So while the #1 goal is to make money, the secondary goal is about managing risk which quickly becomes the primary goal. As we’ve talked to many traders, risk management appears at the core of their activity. How do you manage your risk? What are the steps? …We had hundreds of people [in their Chat room], but only a few contributed, maybe 1%. Many were just lost; they did not know what stocks were or they were experienced traders but I am not here to create the most popular chat room in the world. I am here to create a special forces group of traders that can work on improving their lives together. So we have right now 4 people in the chat room. We are not looking to grow at a high rate either. It’s almost like a process: when someone wants to join, they talk to me. That’s more like a community, right? Exactly. The other day I had someone messaged me asking for signals. You know, “How good are your signals? How much money can I make for the money I invested in the course? Fast.” I am telling them it is not that type of place. This is where you come to learn about trading and how to become a self-sufficient trader. You mentioned that you have some kind of scanners that help you to identify the stocks to trade on a particular day. Could you mention them for our audience? Yeah, sure. So if you wanna trade stocks, the number one thing to do is very quickly start boiling down to a few stocks. I only look at 3 to 4 stocks at once when it comes to the 9:30 open. I am only making 2 or 3 trades per day. It is a difficult process so I use Trade-Ideas. That’s a software that lets you scan and set parameters for what comes up on your scans and this is what I have boiled down over the years to exactly what I need to see. If it’s not on my scanner, I am not trading it. It really saves you from a lot of pain when it comes to overtrading or trading outside of your rules. We have specific parameters that we need to see; we have them for the pre-market, for the afternoon session, and those parameters change as the day progresses. Our list can grow if you don’t change that but as the day goes on, you need to boil down the stocks you are going to trade. So I use Trade-Ideas, but we have other people who use ThinkorSwim parameters, TradingView, StocksScreener. All of those are examples of how to set up your parameters. So here you are: you have all the information on what and how you are going to trade. What is your next move? I can highlight some important parameters that we need. For our style of trading, we are in and out within… I think, my average time is about 1 hour and a half for winning trades. I am not scalping, but what we are looking for is a big momentum. 99% of the time we are shorting stocks so I am technically a short-seller at the moment. But last year I was longing stocks 99% of the time. I think it has to do with how the market is reacting. The one thing we look for is volume. Volume is the lifeblood of momentum traders. It’s the #1 thing that we need to see; it’s what we need both from a fundamental and a technical perspective. It’s almost like a veil from the confusion you might have about where the market sentiment is. It allows us to compare it against other movers and against other stocks; it allows us to make that decision and gives us the focus to analyze the stock with confidence. Another super key factor is a range of the move. If a stock bounces between $1 and $2 all the time, and one day it pops up with high volume but it only goes to $2, I am not really interested in it. I wanna see the stock ten times its range, at least. I wanna see this thing fly. Because this is when people get the most emotional and really what you are doing when you are trading these low-float stocks, these are some risky companies. Some of them don’t do so well and you are looking to trade back to zero because you want to get people emotionally invested in the opposite direction so that you can take advantage. That’s what trading this type of niche is about. Do you think a trader needs a formal education? No, absolutely not. In the age of the Internet, people can get far, far ahead of any type of curriculum that can be made. My previous job was in tech and we looked for people who had the willingness to learn and have a passion to learn beyond. To go and find the answers themselves and learn beyond what a textbook says. That’s where you find true innovation. This is when you find people who are willing to think outside the box. And that what really can make a great trader, somebody who’s eager to innovate, gather the ideas, in spite the fact that this was not taught to them. Before you started trading, did you have any illusion about what trading is? Absolutely. I had no idea about the amount of research and hours I had to spend in order to get anywhere near mastering. I am still nowhere near that. But the amount of work that it takes is something that people should be able to willing to accept. I think one of the greatest examples is level 2 tape reading… It takes years of staring at these moving numbers on a screen in order to identify patterns and be able to make judgments based on the flashy numbers, and how many buyers and sellers there are in the market. Now, that type of thing has been extended by you guys at Bookmap, and that’s why I am such a huge fan of Bookmap. Now I don’t need to be able to calculate or remember all these numbers and what price there were at to identify the fact that there is a big hidden order somewhere or there is an institution coming in. I can just look at Bookmap and see that visually, and that is innovation. However, fully understanding how to utilize that technology is a learning curve in itself. I would still be highly cautious. 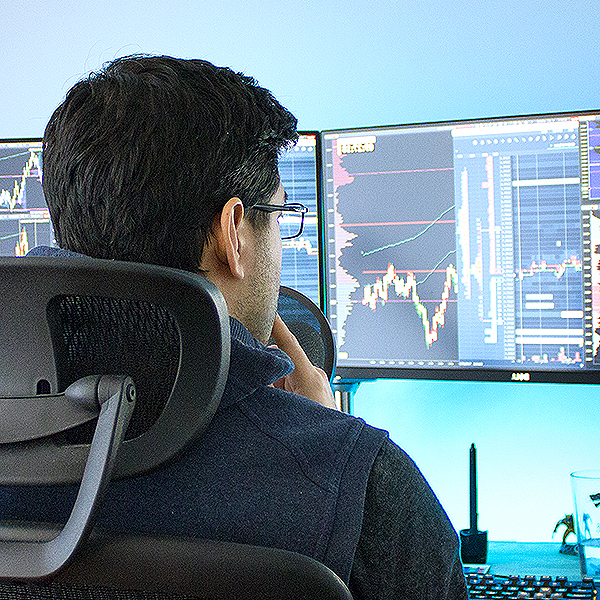 During my trades, when we use Bookmap — and just to highlight what we use: Bookmap for the order flow analysis, TradingView for charting, and I have my broker’s platform for execution — I tell my traders, having too much information thrown at you right away is detrimental to your learning curve. So what they need to do is focus on understanding and being able to recognize patterns, and then, once you are so comfortable in the chart — you know what to look for — identify areas of conflict on the chart.